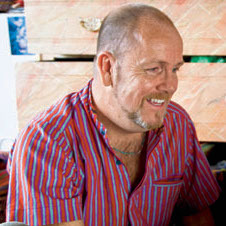 Brandon has been the manager of the Kaffe Fassett Studio in London for more than eighteen years and a regular contributor to the design collections for the internationally distributed Rowan Knitting, Patchwork, and Vogue Knitting magazines among other publications, including his books Knitting with the Color Guys (Sixth&Spring), Knitting Color (Sixth&Spring) and Brilliant Knits (Ebury Press, UK, and Taunton Press, USA). He travels the world teaching color confidence–building classes both in person and online, at Creativebug.com. More info at brandonmably.com.